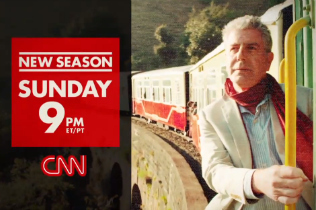 The third season of Anthony Bourdain‘s successful CNN show Parts Unknown debuts this Sunday evening at 9 p.m. ET. The season opens in the tense region of Punjab, India; and includes other destinations like Las Vegas; Lyon, France; Mexico City; the Mississippi Delta; Sochi, Russia; Thailand; and Bahia, Brazil. Mediaite briefly spoke with the iconoclastic host in advance of the premiere, discussing his thoughts on the current state of cable news as well as what to expect from the upcoming series. What can we expect from Parts Unknown‘s third season? That we will do our very best to defy expectations. One guiding principle is to make every show look as different as possible from before. We want to undermine expectations. You visited the sometimes contentious part of India that borders Pakistan. That must have been interesting to experience. Without spoiling the episode, how’d it turn out? We didn’t set out to do an issues-driven show. We largely looked at the past and, in doing that, maybe a little explaining of the present. You sit down for a meal and talk simple things with the locals, and bigger things come up. You learn a lot about what goes on over there just by connecting with people. Tell us a little about what you saw in Sochi, Russia. The Emperor Putin show was shot just prior to Sochi Olympics. I can say it will be illustrative for what the world looks like inside Putin’s Russia. We spoke to dissidents. We spoke to people who’ve fared poorly under Putin, and people who’ve done pretty well. We hope to show a side of that new Imperial Russia that maybe people haven’t seen before. What I realized is: The surprise and uncertainty about Ukraine is neither uncertain nor surprising to anyone who has actually spent time in Russia. I think it was a foregone conclusion for most people there. And with a little bit of vodka, they’d be happy to tell you all about it. We praised your special conversation on gun rights as “refreshingly honest,” eschewing the usual token liberal versus conservative shoutfest cable news is so wont to produce. Do you think that sort of conversation comes naturally to you, or are you just actively repulsed by the state of debate? I think it’s a byproduct of how I’ve traveled so much internationally and found myself having fun and getting along with people from different backgrounds, belief systems, in places where there is historically no reason to love Americans or be nice to us. I’ve spent time with former KGB officers, Vietcong, Wahhabi Muslims in Saudi Arabia — and every time, I’ve been treated well. We had no difficulty relating with each other over a meal; having a basic appreciative, general understanding and respect for each other. I started to look at the parts of my country, geographically, that I’ve grown up to look at with suspicion or contempt. I try to look at them the same way as those other places: with understanding and respect. Whether it’s gun country, or the Deep South, or Texas, places where politically they may come from different background — I always meet nice people, who are fun to have beer with, and love at least some of the things I love. So you find the standard partisan debate to be artificial? It irritates me when I see people shrieking at each other at high volume. They’re often coming from places so ridiculously artificial that it precludes any sort of conversation. Look, I’m not trying to fix that. But I’ll have a beer with anybody. If that leads to understanding, great. For instance, Ted Nugent and I are reasonably friendly. He calls me for tips all the time. We can enjoy barbecue tomorrow. We disagree on pretty much everything, but every once in a while we will agree on something. How do you feel about critics bashing CNN for its wall-to-wall MH370 coverage? I’ve been abroad, so I honestly haven’t followed the story much. I haven’t seen the coverage. When making your show, do you consider what you think the audience wants to see from you? I really try hard to never think about audiences want or expect. It’s lethal. It’s something I never consider. My job is to tell a story, to make something I feel proud of. That’s a good business model. I’d recommend it to everyone else. I’m real proud of this upcoming season. We’re really pushing it, storytelling style. We’re always trying to up our game and do something different. We pushed ourselves, and I’m hoping to do the best work of my career. You’re also a well-known music fan. What are you listening to these days? Right now, a lot of pre-disco funk/R&B. The Brothers Johnson, Curtis Mayfield, Marvin Gaye. That stuff makes me happy.